I just got the new launcher from Mojang.com and tried it. I restarted the computer to clear RAM but still got the same errror. MC-29157 Game crash due to "Invalid memory access of location 0x0"
MCL-561 Client error prevents Minecraft from opening. MCL-693 when I try logging in it keeps on saying "minecraft quit unexpectedly"
MCL-703 i cant log in to any version in the new version. MCL-707 Minecraft does not launch. MCL-719 My launcher for the 1.6.1 crashes at a certain moment. MCL-728 Mac os 10.5.8 users can not play minecraft. MCL-739 Minecraft 1.6 won't open, keeps crashing. MCL-766 1.0.6 launcher doesnt work with Mac OS X 10.5.8! MCL-847 I have updated to the new launcher but when I click play a note appears saying there is a bug in "LWJGL" witch makes it incompatible with OSX 10.5.8 but it dose let me play 1.5.2 still. MCL-890 Version 1.6.1 is incompatible with current environment: There is a bug in LWJGL which makes it incompatible with OSX 10.5.8. Please go to New Profile and use 1.5.2 for now. Sorry! MCL-928 This bug does not let you log into Minecraft with the new 1.6.1 launcher. When you try to log in it says " There is a bug in LWJGL which makes it incompatible with OSX 10.5.8 Please go to New Profile and use 1.5.2 for now. Sorry!" MCL-1057 It says whenever I try to login, a pop-up window opens and says, "There is a bug with LJWGL that makes Minecraft incompatible with mac OS X Version 10.5.8." Minecraft is amazing and I don't want to lose it. Please Help. MCL-1064 1.6.2 came out,u fix the bug and everything but when i logged on this says "There is a bug in LWJGL which makes it incompatible with OSX 10.5.8. Please go to a new profile and use 1.5.2 for now.Sorry! MCL-1072 when i try to login with 1.6.2 the lancher doesnt work with Mac osx 10.5.8 i need to work on my server which has been updated but i can not as to this bug. MCL-1075 Minecraft 1.6 Launcher not working for Mac! MCL-1309 Downloaded new 1.6 launcher. Game will not launch. 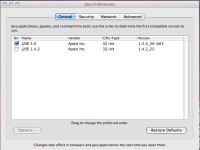 MCL-1312 Minecraft 1.6 won't work with osx 10.5.8, it shows a lwjgl error when I log on. MCL-756 New launcher won't launch previous versions (1.5.2) on OSX (newest version works fine).